By now I have (hopefully) enticed you to daydream about starting your own side hustle. But you don’t know what to do or where to start! Join the club! Luckily for YOU, the world is ever changing. The people that solve today’s problems need to have the super-power of multi-disciplinary skills, passions and interests to find a niche solution. 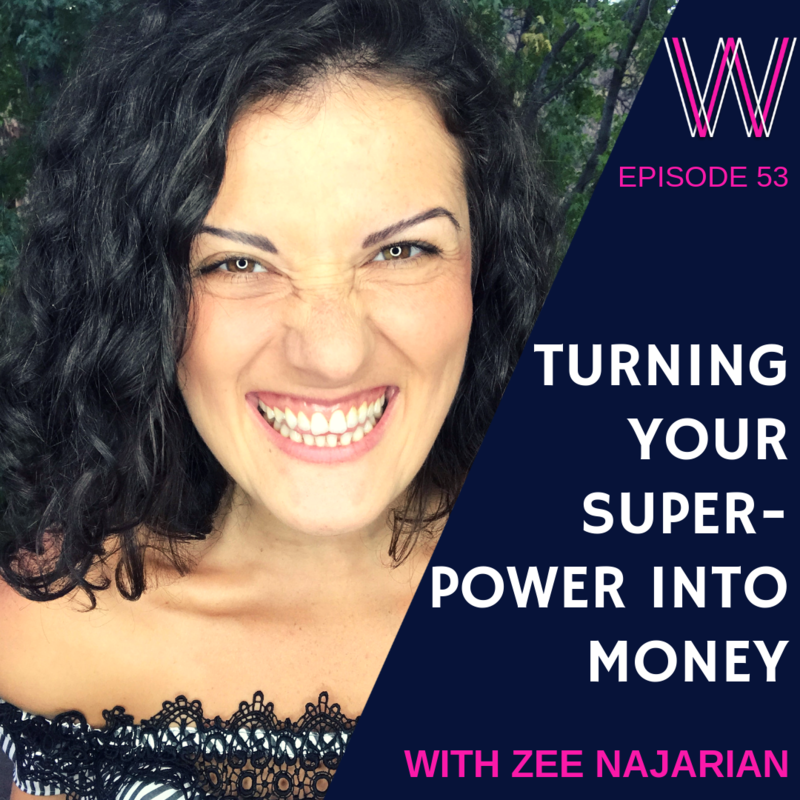 I chat with Zee Narajian – the epitome of the 21st century working woman who balances a full-time job AND a very successful side hustle. She is a self-confessed ‘jack of all trades and master of none’, and her dream is to help multi-passionate women monetise their passions by building authentic digital businesses. Zee epitomises my sentiment – making more money is not about the ‘OR’ life. It is about the ‘AND’ life. Write down 2 to 3 things that you are good at – don’t dismiss the mundane talents! Build a personal brand – people follow people, not what you are selling! Start with the basics, do the work, stay in your lane, take one step at a time and focus! Learn more about Zee Narajian. Zee has also compiled a directory of free resources for beginner entrepreneurs! Enjoy! Lisa Linfield: 00:09 Hello everybody and welcome to today’s episode of Working Women’s Wealth. This is part of a series we’re doing on exploring the possibility of additional incomes or starting your own business. I asked in a [inaudible 00:00:35] a few episodes ago, what would you do with a $1,000 extra or 10,000 rand? It’s a question I hope that many of you have been thinking about because it’s one that I was challenged with when chatting to some wonderful ladies about their finances. What we were challenged with is the fact that they didn’t spend money on extra cappuccinos or eating out. They were living exceptionally frugally because their incomes were not able to stretch far enough to cover their day-to-day expenses. It was a question that I challenged them, which is, “But what happens if you had that extra money?” Their eyes just lit up and they said, “Hey, we would love that extra money.” Then, I challenged them as to why they don’t have it. Part of the discovery process that I went through was that for many people, they didn’t know how easy it was to start a second stream of income. It doesn’t have to replace your job. It can just add to your monthly income. Lisa Linfield: 01:41 I encourage many people or all of my clients after the age of 50 to start the second stream of income, so that when you do get to the stage of being forced to retire by your company that you’re able then to have something that you can fall back on or that just reduces the amount of income you need to draw from your savings. Lisa Linfield: 02:01 Today, we’re joined by Zee Najarian. She is both a nine to five employee and has a side business. Hello Zee, welcome to our show. Zee Najarian: 02:13 Hi Lisa, I’m so excited to be here, one of my most favorite things to talk about, I love to talk about having a site hustle and bringing some extra income, so I’m really, really excited. Lisa Linfield: 02:23 Great, well thank you very much. I appreciate it. You are both a nine to five employee and have a side hustle. What do you do in your nine to five and what is your side hustle? Zee Najarian: 02:35 In my nine-to-five, I’m a payroll manager, something that I kind of stumbled upon. Then, just went with it, continued to get degrees and certification. I had lots of trouble growing up and in school, trying to figure out what my major was going to be. I thought it was a life sentence. I thought I’m never going to be anything because I couldn’t figure it out because I liked so many things. I stumbled upon that field and it’s been working great. As my side hustle, I help multi-passionate women monetize their passions, the things that they love to do into a digital business, so that they can create some extra income, they can have some time freedom to really do the things that brings them joy in their life. Lisa Linfield: 03:19 Before we go into that how do you balance doing both a full-time job, managing staff, managing payroll and having your own side business? How do you get the energy or the focus or whatever it is to do that? Zee Najarian: 03:34 Yes, so we always hear people talking about boundaries, you need to have boundaries. I always thought that this was such a weird concept, like growing up, we didn’t have boundaries, like as culturally where I come from. Our family doesn’t have boundaries. Everyone is all up in everyone’s business. As I was starting to realize that, “Okay, I need to have a side hustle, there are things that I’m passionate about that really I need to do that brings me more fulfillment,” I started really realizing that boundaries aren’t limiting. We have this belief that it’s so limiting, why do we need boundaries? Actually, they’re very freeing, so the fact that I have a nine-to-five that sets up some boundaries for me. I know that during that time that I’m at work, I can’t really be doing anything else. I need to focus on my work, so that gives me some structure. I’m sure you’ve heard about entrepreneurs, they talk about it all the time when they first either quit their nine-to-five or they start their business, they kind of have no structure. They no longer have someone telling them what to do, telling them when to go to work, what time they have to be there. That kind of gives them so much freedom that they don’t know what to do with it. They waste their time. Zee Najarian: 04:46 The fact that I know during eight to five, I can’t be doing anything else, except focusing on my work, so that really helps me create structure. Then, any time that I have outside of that I know that, “Okay, I can dedicate maybe two hours in the morning, I can wake up early or an hour early and then, I can dedicate maybe an hour too in the evening.” It all has to do with figuring out how you’re going to [inaudible 00:05:13] your boundaries and really, time blocking and sticking to it. The more time you allow yourself to do tasks, the bigger the task will get. It will always expand to the time you give it. If you give it a month, it will for sure take a month, but if you tell yourself, “I need to do this in five hours,” and you stick to that you will definitely get it done in those five hours. Lisa Linfield: 05:36 I absolutely agree with you. I think one of the misnomers that people have is that they need to be sitting at their desk for 20 hours in a day in order to be seen as delivering. More and more the work environment is moving away from that. It’s what you actually deliver in the hours that you’ve got. I always say to everybody, who says, “Well, kind of I can’t do that.” If you stick to the hours you’re paid for, you’re trading your time and your focus in that time. You work on your side hustle after that. I promise you, you will deliver everything you’re supposed to deliver and probably more in that nine-to-five because you’re much more focus about not meeting a colleague for tea or whatever. It’s get that work done, so that you can spend the time on your dream. Zee Najarian: 06:22 Yes, I absolutely agree. When I was first starting out, I would dedicate that one hour that I had for lunch time. I would dedicate it to, “Okay, I’m going to eat for like 15 minutes and the rest 45 minutes, I’m going to actually dedicate to figuring out what I need to do, how I’m going to get my business started.” You learn to become so much more efficient. I think another thing that we do is we underestimate the power of like 10 to 15 minutes. We think, “Oh, it’s just 10 minutes, I’m going to scroll through social media instead,” or “It’s just 10 minutes, I can’t get anything done.” If you actually sit down and you create a schedule of one day, like what did I do today? Try to account for every 10-15 minutes and make sure that you have like 24 hours when you’re done, you’ll see that you’re all of a sudden missing like two, three hours, why, because you spent 10 minutes here. You scrolled through social media for 15 minutes. You watched TV for 20 minutes and all of this adds up. You start to become more conscious of how you’re spending your time. Zee Najarian: 07:28 The best thing that I could say for someone, who’s thinking about starting a side hustle is to not underestimate the power of 10 minutes. Lisa Linfield: 07:37 That’s a fantastic, fantastic thing to think about, I hadn’t and I think it’s very valid. I also think that one of the things that one does is because you create that focus of maximizing your time and because you’re working on something that you’re passionate about, you actually look forward to spending that 10 minutes working on your side hustle. Zee Najarian: 07:58 That’s absolutely true. You have times, where time just flies by. Then, you have times where you’re like, “This 10 minutes felt like they lasted an eternity.” When you’re actually doing something that you really, really love, you look forward to it, you actually get into it, you get into that state of flow and you get so much more done in 10 minutes than you could in one hour, if you were just not focused enough. Lisa Linfield: 08:23 Absolutely, so your goal is to help multi-passionate women monetize their passion into digital business. What is a multi-passionate women? Zee Najarian: 08:37 I’m sure you’ve heard of the saying jack of all trades, master of none that was something I heard most of my life growing up because I liked so many things. I wanted to do so many things. I couldn’t figure out a major. I was like having a midlife crisis when I was in my teens and that came from the fact that I was multi-passionate. I liked so many different things. I was good at a lot of them. People kept telling me I need to stop that and I need to become a master in one thing. I can’t just keep trying things out. People are going to think I’m flaky. They’re been think that I don’t stay true to my word because I keep jumping from one thing to another. That kind of just led me to have so much anxiety and think that I’m never going to be able to master anything, I’m never going to get anywhere. I realized as the years went by that we’re in this age, where we have different problems. We have unique problems because of advancements in technology because the world is changing. It’s not the same world that our parents or grandparents grew up in. Zee Najarian: 09:42 The people who are going to really be able to come up with the solutions to these unique problems are these multi-passionate people, who can combine multiple interests, maybe they’re interested in the arts and also in science and also in philosophy. I don’t know, different things and that they can use pieces of those different things that they really like and they can combine that to come up with a very unique solution to these unique problems that we have in the 21st century. Lisa Linfield: 10:09 I think it’s a wonderful observation and there were two thoughts that sprang to mind as you were talking. The first one was I was watching a video this morning on a skill I’m trying to build and the presenter said he was labeled ADD when he was younger because his concentration will go to so many different things. He said, “You know what that’s my superpower because I’m so interested in so many different things that I pulled them together to be unique value propositions for clients.” I think that’s absolutely true because I think the challenge so often in life is that we try and provide a solution that’s out of the context of a human being, who is so multifaceted. I mean in my particular world, the one thing I’ve learned is that there is very little about money that has to do with knowing the technicalities of investment. Yes, you need to know how to do some of it, but that’s like 10% of wealth. The other 90% is the complicated human beings we deal with. For me, it’s such a huge thing that you are able to connect the social side, the relational side, all the various different sides of a human if you want to be an effective wealth manager because it’s never ever, ever the right thing that the spreadsheet said and what happens in reality are completely far apart. Lisa Linfield: 11:26 When you’re helping multi-passionate person, where do you start because if the person comes to you and they say, “Hey, you know what, I’m passionate about orchid developing and I’m passionate about money and I’m passionate about knitting,” how do you help them to work out which of those passions to monetize into a digital business? Zee Najarian: 11:45 Passionate women come up to me and they’re like, “Well, I have so many dreams and I don’t know which one to follow,” or it’s the flip side. They tell me, “I have no idea what to do.” To that I always tell them, “I don’t believe you, you always know what to do, you’re just not trusting it and you’re not following through with it.” Then, you have to go through a series of exercises to make them trust that feeling that they have because we all have this gut reaction. We all have like this gut instinct, but we ignore it. We think that, “Oh, it must be something else, I must be nervous, I must be that we label as other things,” but we always have the answers within us. We go seeking outside for these answers, but they’re already there. A lot of what I teach is based on feelings. Zee Najarian: 12:33 First, I tell these women to start with what you already know. If you’re telling me, “I don’t know where to start, I’m not good at anything,” so I tell them to start with something that they know. For example, you might know … I really, really like cooking. That’s something that I’m really passionate about, but what am I going to do with that? Start with that and then, think about two to three things you can do that’s related to cooking. Maybe you can go out and you can take a cooking class, maybe you come cook dinner and give it to a neighbor, maybe you can go find a meet-up, where women are getting together and sharing recipes. Once you get the ball rolling, once you actually take some action instead of sitting around and saying, “I don’t know what to do, I’m not good at anything or I have so many dreams, I don’t know which one to follow,” you need to actually start taking those steps because once you get momentum, objects in motion like to stay in motion. Once you start actually taking action, getting into momentum, the clarity will come after. Zee Najarian: 13:36 I worked with this lady, who was really just not knowing where to start. She actually … The cooking example is her example, so she’s like, “I really like cooking, but I don’t know what to do.” She ended up actually taking a class at a local community college, a cooking course. Then, she met a lady there, who was actually trying to create a cookbook and they ended up collaborating. She helped her with the recipes. She helped her with setting up the shots. That actually led her to something. You never know where things are going to lead you. You just need to go with something that you already know, something that you’re passionate about and just take the first step. Lisa Linfield: 14:17 I totally agree. I was interviewing a woman the other day. We were talking about this whole thing of starting out. I firmly believe that even if you just join Facebook groups that are available in your field, you will start seeing what people are talking about. You will start seeing the need. As you say, the minute you start stepping into it, what you start with and what you end with are completely different things, but it’s part of the whole journey that until you actually take action, those things are not going to become available for you. Zee Najarian: 16:10 I started with Instagram. I’m doing something completely different now. I’m not even teaching spin anymore. I’m not sharing recipes. I started with something that I knew and then that led me to different opportunities that led me to exactly what I’m doing now. I can’t imagine if I just stopped there and I told myself, “I have nothing, I don’t know what to do, no one’s going to want to listen to me, I have no talents, I have nothing to share with the world.” That would have kept me stuck forever. Instead, I just took like one step after another, small tiny steps and then, look where I ended up. Lisa Linfield: 16:46 When you teach people about doing it through digital, why did you choose a digital business rather than just helping them monetize their passion in any form? Zee Najarian: 16:57 Well that was my journey, right? I was craving that independence. When you are able to slowly have a digital business, you don’t have to worry about a physical space. You can do this from anywhere in the world. I wanted to be able to be on the Eiffel Tower and still be able to work. I wanted to be able to be in the mountains somewhere, I wanted to eventually be in charge of my time, my money. That’s what I was craving. That throughout the years had translated into other things for me. As I was growing up, I thought that being a musician would get me there. I thought that being an actress would get me there. I was thinking of different ways. I just didn’t know how to put that into work. My journey was that really just wanted the freedom and I wanted to be able to show up in any capacity that I wanted to show up in. I didn’t want to have limits. Those are the people that I work with that they’re really craving that independence. They want to be in charge of their time. They want to be in charge of their money. They don’t really want people to limit them and tell them when they have to work and tell them when they have to show up. Lisa Linfield: 18:06 You know what, I mean I’m a living example of that. In my first year of business, which happened to fall into when we were going to Austria, I would wake up half an hour before everybody and I would have cleared all the actions that I needed to care, sitting in the middle of Austria, able to serve everybody the same way. You’re not limited as to when you can do things. Part of my journey has been integrating work and home in a much more flexible way. When my children are on holiday and I want to take them away, I can take them away for a longer periods of time because I don’t have to apply for leave and because I can still serve my clients from wherever I am in the world. Zee Najarian: 18:46 Isn’t that an amazing feeling? Very few things come close to that feeling. Lisa Linfield: 18:51 Absolutely and I always say that the definition of financial freedom, part of that definition is that ability to choose when, where and how you work and when you stop working. Zee Najarian: 19:01 Yeah, absolutely. Lisa Linfield: 19:03 When you start getting people up to speed in terms of the digital business, what is the process that you take to help people find their path? Do you give them practical steps or is it mostly a coaching type service? Zee Najarian: 19:18 I do have a digital course. That’s for people who already kind of know what they’re doing and now, they need to start studying up their digital systems, their landing pages, their list. When women come to me and they’re like, “I don’t know what I want to do,” or “I have too many things and I just need to really get focused and put my multi-passionate skills into something that I can start helping people, I can start serving people.” Most of these women, they’re like, “I’m tired of jobs, I’m tired of people telling me what to do, I just want to do things my own way, I really want to find out how I can serve the world in a bigger capacity.” Mostly, they’re custom tailored to the person. I do have guides and I do have questions that are standard, but each situation is very unique. I work with them privately. Zee Najarian: 20:11 I go through these exercises with them, where one of them is telling them to start with what you already know. I go through a test when they have way too many dreams and they don’t know how to narrow it down. I have this thing called the Chill Test, so they go through each of their dreams and it’s a visualization exercise. You really start to get in tune with our feelings and figure out which ones do really … When we think about them, when do we get the chills? That’s like a feeling that your body gives you that that’s the direction you should be going. Then, we work through exercises to really figure out what their strengths are, what their passions are and then, figure out how they can combine this into one unique solution that they can offer to the world. Lisa Linfield: 20:57 If you know absolutely nothing about a digital business, so let’s use an example, you’ve been in a corporate and you’re a payroll manager. Now, you’ve decided that your passion is flowers and teaching people how to keep flowers alive. You don’t know anything about an online business. Where does anybody start to start an online business? Zee Najarian: 21:18 You can’t really make any money if you don’t have a clear message and you don’t have people, who want to pay you for it. It’s a slow process. I’m not going to lie. It’s not something that’s going to happen overnight. If you were starting something digitally, it took me about three years to actually be able to figure out, “Okay, what is it that I want to do in this space and to build a following, so that I can start generating money.” I’m not saying it’s going to take you that long. If you know exactly what you’re doing … I had no idea what I want to do. If you know what you’re doing, it’s going to be a lot quicker, but you need to first get your messaging straight. Then, you need to be able to find the audience and attract the people, who are going to be paying for your services. It’s going to be a process of putting yourself out there and people want to connect with people. Most people don’t really care what you’re doing. They want to know that you’re a human. They want to know that they can connect with you and you need to be able to build a personal brand. People follow why you’re doing things, they follow you more than they follow what exactly you’re doing. Lisa Linfield: 23:52 I think that’s a really important thing because none of us know where our journey is going to end and it is one of the debates that often people, who start businesses have. I had it in my own business was do you promote Lisa Linfield or do you promote Working Women’s Wealth? When I first left corporate, I had spent 19 years, being indoctrinated that it was all about the team and it was all about the business and it wasn’t about Lisa. I used to say, “We interviewed so-and-so in the last week,” when there was no we. It was just me. It’s been one of the journeys that I’ve had to merge into, which was that the brand is Lisa Linfield and Working Women’s Wealth happens to be a podcast that I do. I also want to teach and it can be women and men that I teach. I don’t have a specific bent that I will only teach woman. I’ll teach anybody who wants to learn because a dad, who understands his money can teach a daughter, so it was a huge journey for me into this whole thing of if you only do Working Women’s Wealth, it doesn’t give you the flexibility to be able to do children’s wealth. On Wednesday, I’m teaching six-year-olds about money and it’s one of the highlights of my year is to teach them about money. Lisa Linfield: 25:08 How would I do that if I box myself to working women? I think it’s a hugely important point that this journey is going to morph and change. You got to kind of roll with it and be open to it. It’s only once you start developing yourself and your value proposition that you actually can find that the path will unfold and it might be the same and it might be different to however you thought it would start. Zee Najarian: 25:34 Yeah absolutely and that change, the transition happens naturally. There’s no like this abrupt, “Okay, today, I’m this, tomorrow I’m that.” It’s like a natural evolution. Just as you’re changing, as your personality is changing, your likes are changing, it happens naturally. There’s a natural flow. It’s very, very different in the corporate world. You’re absolutely right. It was so weird to me when I was four starting out to build a personal brand, to put my name out there, I was very, very hesitant. I even started out with something else and then, quickly within a few months, changed it because it’s a really weird concept to market yourself, to promote yourself. You’re your own brand. You’re branding yourself. For some people, it feels very weird and it’s just the nature of the corporate world. Lisa Linfield: 26:25 Absolutely and I also think that it’s part of that almost Anglo-Saxon upbringing that you must never self-promote when in actual fact, the reality is if you go through the cycle of that people will buy from people they trust and they will only trust you once they know you and like you, then it is far easier for people to know and like and trust a human than it is to know and like and trust orchids.com. It means nothing. Zee Najarian: 26:55 Yes, absolutely, absolutely true. Lisa Linfield: 26:57 Most of us start with great intentions. We listen to a podcast interview that inspires us. There’s a talk that inspires us. We chat a friend that inspires us and we are going to set the world alight. We work on our idea for the next two or three days because it’s aha moment and then, life happens. How do you advise women to keep themselves going, to keep that momentum going to cross each next kind of hurdle and not give up? Zee Najarian: 27:28 I think the biggest changes, the biggest transformations in my business when I take an inspired action. For example, I’ve gone to a live event or I’d seen a talk, I’ve listened to something that’s very inspiring and then, right after, I’ve actually taken some action steps. That’s when you see the biggest momentum, the biggest changes happen. It’s the worst thing when you’re really, really inspired and you either kind of let it die out, you don’t know the next steps to take or you maybe take a step or two and then, like you said, you let life get in the way. You need to really get into that energy when you’re really inspired and you listen to things and you get these feelings that, “Okay, I’m going to conquer the world,” you need to really use that energy. You need to be able to take away like two to three things that you can implement immediately. Zee Najarian: 28:22 When I go to live events, I love live events, they’re so inspiring. I’m around people who are like-minded. They’re may be in the same industry. Before I leave that event, I write down a list of two to three action items that I’m going to take immediately, like as soon as I get home or if I’m taking a plane ride, I’m going to even do it on the plane. I’m going to take those actions immediately. Then, I write down like my feelings about how I feel right now, why am I so inspired, what’s the vision that I’m having. When I can get those thoughts down on paper right then when I’m really inspired that’s what’s going to keep me going on those days where I’m like, “Okay, well that inspiration is gone,” I’m going to go back and read that thing that I wrote when I was really inspired. I’m going to see that vision. I’m going to see what I was feeling at that moment. Zee Najarian: 29:42 When you have that vision written down, when you have those feelings that you felt when you were really inspired, then those are the things that are really going to help motivate yourself and help you keep going. Lisa Linfield: 29:54 There were a couple of things that I also picked up of what you’re saying and the first one was part of it is that you need to actively seek out these moments, where you can be with like-minded people. If it is a live event or even if it’s a Facebook live or a webinar event or something that you can subscribe to, to try and put those into your diary as frequently enough to know that it’ll keep you going. It’ll give you that energy and momentum. If it’s like a peak of the inspiration straight after an event or a webinar and then, it drops down to make sure there’s another burst of inspiration before the next one. Don’t only do something once a year and hope that it’s going to give you enough energy to go through it because this is a lonely journey. Zee Najarian: 30:39 That’s a very, very good point. That’s absolutely true. I have a list of podcasts that I go to. I’m very, very big on Audible, so I have a list of books that I’d listened to for like maybe four or five times because I know those things are things that are maybe when I’m feeling down, maybe when I’m feeling like quitting, those things are the things that really ignite that fire again. They keep me going. If you’re starting a digital business, it’s still such a new thing. Now that I’m in that field, I know so many people in it, it feels like the whole world is in it, but the reality is in real life, besides the people I’ve met through this journey in these past four years, I don’t know anyone in real life, who has a digital business or who even knows what that means. When I was first starting out, I felt so lonely, I felt so weird. I would talk to people about it and they had no idea what that is. Lisa Linfield: 32:21 I forget it because when I started two businesses at the same time, Working Women’s Wealth and a wealth management business, everyone could relate to the real life wealth management business that I did, but they have and still have no idea what my vision is for Working Women’s Wealth because they can’t relate to it. In the podcast interviews that I’ve done and people that I’ve interviewed, so many of these amazing women who have achieved stuff, when you ask them who is their inspiration or motivation or mentors or whatever you want to call it, so many people, particularly in this business name people in the business. Their mentors are books. Their mentors are following someone on Instagram. Their mentors are not the old fashioned that in a corporate you find someone up the ladder and you buy them coffee every second or third month and hope that they can teach you stuff to get your career going. The minute you start trying to monetize your passion and have an online business, you need people who understand online businesses and who rebuild them and who are in it and not just a marketing department that you’re not actually a part of. Lisa Linfield: 33:33 For me, it’s been exactly that. I had no idea. I left corporate 15 months ago and had no idea how to do anything. I took free online course as to how to build a website. I paid for a course as to how to start a podcast and in that came a whole community of people, who were encouraging each other to do exactly the same thing. I wanted to start to learn how to create an online course, so I bought a course as to how to create online courses and in that came a community of people, who encouraged me at every step to keep going and to achieve my goal and to get it done. I think that it’s part of the thing that I’ve learnt is that my biggest supporters, yes my mom and my husband adore me, my mom does listen to some of my podcasts, my husband listens to none. My biggest supporters are the people in the groups that I’ve joined that have taught me how to build an online business and what it is that I’m trying to achieve and celebrated when I earn $2 of revenue from Amazon Affiliates and understood why that was such a major thing. Zee Najarian: 35:28 Yeah and isn’t it amazing how people who barely know you or don’t know you at all, how much they will get excited for you, how much they will cheer you on? I found the most amazing community online of people, who I haven’t even met in real life, but they’re my biggest cheerleaders. They get so excited for me that the first few dollars that I made online were so exciting to me, like you said, a lot of people don’t get it, but I had a community of people, who cheered me on. They were so excited for me. On times where I was down, they reminded me that I’m not crazy, so it is really, really heartwarming to know that you can find a community of people, who maybe they don’t even know you at all, but the fact that they’ve been through the journey, they know what it feels like, they will be there for you. They will cheer you on. They will lift you up when you want to quit and it’s really, really hot warming and very, very amazing, very humbling. Lisa Linfield: 36:24 It is humbling. I mean through my podcasts and the people I have interviewed and through my groups, there are people who I can talk to once a week, who I have never met. The thing that we have in common is this dream that the $2 will represent $200 and will become $2,000 and might even become $20,000 or $200,000. They understand that part. When people start out, in your experience, what’s the most common mistake people make when they start out? Zee Najarian: 36:55 I think the biggest thing that I see people, who are starting out and I did this too is that we have shiny object syndrome. We want to get this and that and we want to buy a course on webinars and we want to buy this like cool new social media tool. We want to just jump on everything, why, because we live in such a noisy world that we don’t know how to put our blinders on and really tune everything out. We hear someone is doing this cool new thing and then we’re like, “Oh, maybe we should be doing that.” We don’t understand that we’re comparing ourselves to people, who are not in the same level. These people are years ahead of us. They can be doing all of that. They can be jumping on the crazy new tool that’s come out that’s going to help take their business to the next level. When you’re just starting out, you need to focus. Zee Najarian: 37:45 You first need to have a really, really clear vision. If you don’t have a clear vision and a clear message, you’re never going to make money. No matter what top-of-the-line webinar tool you have, no matter what course you just took, thousands of dollars you just spent, none of that is going to help. You need to start with the basics. You need to do the work. You need to be able to slow down, to speed up. You don’t need all these crazy things that everyone else is doing. You need to stay in your lane. You need to get focused and you need to just take one step after another. Lisa Linfield: 38:19 What reasons then do people give you that they don’t launch their business? Someone comes to you and they have all these great intentions and then, they go down the road and you touch base with them a little while later and you realize that they’re completely stuck and that they haven’t actually launched. What are the biggest reasons that people give you for that? Zee Najarian: 38:39 Well, I don’t have enough money to pay someone to create my website, I don’t have the time right now to create a whole course, I don’t have enough money to pay for this crazy webinar system to host a webinar. Those are all the excuses. Mostly, I don’t have the time, I don’t have the money and I have nothing to share with the world. Those are all excuses, why because we’re scared, we’re scared of putting ourselves out there, we’re scared of failing, we’re scared of succeeding. We just don’t want to just get out there, be vulnerable and do those things that are really going to help us, they’re going to help put our gifts out in the world that if we have these desires, I don’t believe that we’re ever given a desire that we’re not meant to fulfill. If you already have these feelings within you, if you have these desires, you’re meant to put them out into the world. It’s really what the world is going to need and we don’t know the effect of what we’re doing. We don’t ever fully see the effect of it. We might see in the media, like, “Okay, fine we did something, we helped one person.” We have no idea where that has led us. That one person might end up helping hundreds of thousands of people, so you never see the full effect of the things that you’re doing. Lisa Linfield: 40:59 I mean these days with Facebook Live and all of that you can speak to anybody anytime. Lisa Linfield: 41:05 I mean when I started, I really had a good camera and I used to think that I had to set up my room every single time I would try and make a video. What would end up happening is that I would record five videos in the morning and kind of do a costume change of a shirt in between and then, it’s been months and months and months since I’ve done a video. Recently, I’ve just looked at myself, why am I being so silly? Let me just record it on my phone. I literally have recorded more videos in the last two weeks than I have in the year preceding it because I thought I had to have everything absolutely perfect with perfect lighting and a perfect camera and a perfect everything when meanwhile actually good is better than not done at all. Zee Najarian: 41:51 Yeah, done is better than perfect. Lisa Linfield: 41:53 Absolutely, done is absolutely better than perfect. When all of us start out, there are absolutely always going to be people, who question. The naysayers, people who don’t support you, how do you deal with that? Zee Najarian: 42:08 Oh well, I’ve had so many naysayers and everyone does. It’s simple, you just have to not care. That’s it. I mean, yes, it’s not easy. Yes, we’re brought up to in certain cultures to really care about what other people think, but here’s the thing, other people are not living your life. Other people are busy trying to figure out how they’re going to live their life and how they’re going to be happy. Other people are not paying your bills, so you need to focus on what’s going to make you happy and as long as you’re not doing anything to hurt other people, you’re not infringing on other people’s rights, you go out there and you do the things that bring you joy. Don’t worry about what other people are going to say. Even Mother Teresa had people who didn’t like her, so it doesn’t matter who you are. You can be a saint, there will be people who don’t like you and who have something to say. You just have to not care. If you’re going to be successful, you have to not care. Lisa Linfield: 43:10 You know what the thing is, you also have to have a vision of what it can be that you hold on to. I’m 15 months into this journey and one of the things that has been the most unbelievable upside or positive of the journey that I’ve had is not physical in my business or any of that kind of stuff, but it’s how much I’ve grown as a human being because I think when I first started, I had been so in a corporate, my identity had been so wrapped up as a high achieving at school and at the university and at work and all of that kind of stuff that I think there was so much of me that I had never got to develop because it was hidden behind good performance reviews in a corporate and good results on an exam. I think in the last 15 months, probably the biggest benefit of this entire journey that I’ve done is a much stronger, deeper confidence that’s building inside me because every day when I do something new, I challenge the boundaries of fear. Lisa Linfield: 44:17 When I record on these one-minute videos that teach people how to do something, it used to scare the bejeebers out of me. It was a massive thing that would take 15 minutes for everyone when I recorded or 15 tries for every one minute. Now, I just get up and do it, why, because I really don’t care if my makeup is perfect or my hair is out of line or if I stumble my words. There is a deeper sense of self-confidence that comes through facing all of these fears and building your skills and achieving little things of one person liked your video. Then, [inaudible 00:44:52] that comes through staying in your comfort zone. Zee Najarian: 44:55 Yeah, being a business owner, being an entrepreneur is the bravest thing I think that people can do because like you’ve said, so much of it is personal development. I’ve grown so much in these four years that I haven’t grown this much for most of my life and people around me notice it and people who have known me since I was a little kid. My friends, they tell me, “You are so different.” So much of business development is personal development. It is the most craziest journey that you will ever go on. Lisa Linfield: 45:29 Absolutely and you know the thing that I loved about your story, which is one of the reasons I sought you out was that you were absolutely still maintaining your nine-to-five job and building this passion of yours slowly. I keep saying to people, “It’s all about the and, not the or.” It’s not about giving up your job and trying to focus full-time on building this business. It’s about saying to yourself, “You know what, there’s something I’m passionate about, something that I can develop that can be mine that I can work on slowly as a wealth manager.” Retirement is a massive focus of mine, but by the time you’re 40 or 50 or 60 or however long it takes to build this thing, you never know it might then be your full-time job, but you can build it slowly because all of this whole process is about time to build your customer base, your potential customer base and all of that just really does take time. You may as well start it and learn whilst you’re still earning your full-time income. Then, put yourself in a position, where you could put yourself or your family in financial risk, it’s not an either/or, it’s an and. You can do both. Zee Najarian: 46:45 Yeah and I think that is why a lot of people shy away and they don’t want to restart. It’s because they’re afraid that they need to do drastic things because we hear about these stories, where people quit their job, they go homeless, they get a divorce, they give their kids up for adoption, like all these crazy things, we hear about extreme stories because they make for good stories. The fact really is that most of the people don’t have those extreme stories. Most of the people are people who are quietly starting something, who take years to develop it, who are doing something because it brings them joy. Then, eventually you never know where these things will lead you. If you’re one of those people, who’s getting discouraged that, “I don’t have any crazy story, I can’t quit, I have bills to pay, I have a family to support,” just know that most people don’t do those things. Most people start very slowly. They start maybe 20 to 30 minutes a day and then, it just builds on from there. Lisa Linfield: 47:44 Absolutely and when some people say, “Well, where do you find the energy to do it?” I keep saying to people, “The energy comes from doing something that you’re passionate about.” The last company that I worked for had birthday leave. On your birthday, you could take the day off. As this year was my first birthday out of corporate, I decided that that was a corporate practice that I was absolutely going to keep now that I’ve had my own business. I took birthday leave off. By three o’clock in the afternoon, I found myself back at my computer, sneaking from myself, like sneaking from me back to kind of do a few things, why, because my birthday was on a Wednesday and I love what I do. On Wednesdays, my podcast goes live and I wanted to see, had anybody downloaded it for that day. It’s very different, trying to force yourself to have the energy to study for something or do year end budgets or close the financial results when it’s not your passion. When you are working on something, you get excited. Lisa Linfield: 48:46 I’ve got to course I’m doing at the moment, I can’t wait to not watch television tonight, so that I can quickly get a few more modules of my course done because I’m finding it fascinating. It’s a completely different type of work when you are building a passion based business rather than earning [inaudible 00:49:04] business. Zee Najarian: 49:05 Yeah, absolutely. Lisa Linfield: 49:06 If you were listening to this or if I was coming to you and I’m in a job and I would just like to try out this whole thing that we’ve been talking about, what would be three things that you think that my audience should think about or should undertake or three questions they should ask themselves, what would be the next three steps that they need to take in terms of just exploring what’s out there for them? Zee Najarian: 49:34 Yeah, so first, ask yourself, “What do I already know, what are the things that I already know that I like?” Oftentimes, these are the things that we say, “Oh that’s common sense, oh everyone knows this,” we dismiss these things that we’re really good at because it’s something that we’re good at. We’re so close to it that we don’t notice it. Really start thinking about, “Okay, what are three things that I already know about me that I really like?” Maybe this can be something that you liked since you were a little kid. Maybe this can be something that people are always coming to you for, asking you questions about. Maybe this is something that you do when you’re trying to procrastinate. Maybe it’s something that you daydream about, so really get focused and think about few things that you already know. If you absolutely can’t think of anything because this was me, I was like, “I can’t think of anything, I’m not good at anything,” then you go to people, who are really close to you, people who you know and you trust and you ask them, “What do you think I’m good at and what would you come to me for help or advice with?” Those are really good indicators of how people see you and oftentimes, people see us better than we see ourselves. That’s the first thing. Try to figure out, narrow things down, start with things that you already know. Zee Najarian: 50:52 The second thing is think about how you can put maybe one or two of those things into action. Can you reach out to a friend and do that one thing that you’re good at? Maybe you realize, “Oh, I’m really good at helping people figure out what major they should pick.” Can you reach out to someone, a friend, a friend’s kid, a neighbor, someone and offer to help them to figure out what their major should be? Can you find a local meetup that gives painting lessons because you really like painting and can you attend that? Figure out two to three action items that you can take. Zee Najarian: 51:30 Then, the last is sit down and write down, like maybe three to four things that you really value, things that you stand for, things that you can start talking about to people that you can put on social media. For example, I’m a huge women’s advocate. I have been involved in the nonprofit world ever since I was a little girl. I realized that it has been a huge part of my life. I’ve naturally really enjoyed it, but I never thought I can do anything with that. That’s become one of the things that I promote on social media. That’s become a part of my brand identity. People know me for that. I’m a woman’s advocate. I’m a rebel. I like to do things my own way. Figure out things that you stand for. I stand for truth. I stand for helping people out. I value collaboration over competition. I don’t believe competition exists. Those are the messaging that I put out on social media. I hardly ever talk about what I do. I almost never sell my services on social media. I attract people to me that really like who I am and are always going to support me. Write down the list of about four to five things that you really value, the things that you stand up for that you can start talking about that you can start promoting on social media. Zee Najarian: 52:46 Those are the three things I would start with. Then with that after I have all of that then, if you have a Facebook, you have an Instagram, you have a social media account, really just start sprinkling that in, start putting quotes out there. Start putting pictures of you out there and really just talking about who you are, what you stand for and what your values are. Lisa Linfield: 53:07 That’s fantastic. I really resonated with all of that. Zee, if people wanted to learn more about you or follow you or get to really kind of dig deeper into this, how would they get ahold of you? Zee Najarian: 53:20 I’m at Zee Najarian across all social media platforms. Mostly, I’m on Facebook and Instagram. Then, my website is also zeenajarian.com. Lisa Linfield: 53:29 Well, thank you so much Zee for being with us and for sharing your wisdom and inspiration. I think that’s a wonderful story and I really appreciate it. Have a great day and thank you for coming on our show. Zee Najarian: 53:41 Thank you Lisa. It’s been a pleasure. Lisa Linfield: 53:44 That was Zee Najarian. I love that interview for how well it dovetails with our episode two weeks ago, which was with the paddle boarding CPA. This whole thing that you don’t have to try and solve the whole world’s problems tomorrow that the first step that you need to take when starting your own online business or making some money from your hobby is to just step into the space. Really, it’s not going to happen unless you take those first steps and as you learn and as you grow, absolutely it will unfold and shape and change and you will learn more than you’ve ever learned. What’s more is that you can slowly start building some extra income that can help you save for the holiday you’re wanting to go on or getting to your retirement quicker or anything, your children’s school fees. It just I hope is opening up some thinking on the fact that we aren’t governed by just the job that we’re doing now that we should look to create that second curve of income that second curve of interest in a way that is in our control for Plan B and a little bit of time in five to 10 years. It doesn’t happen and you don’t make multi-millions quickly, but what you do do is build, learn and grow a source of income that can definitely add to your enjoyment of life. Lisa Linfield: 55:13 I’m Lisa Linfield and this is Working Women’s Wealth. Please go and see all the links in our show notes on workingwomenswealth.com. You’ll find many more great resources on not only building your second income, but what to do, how to invest it or get out of debt with it. Take care and have a great week. If you are looking for some great ideas to start making money from your couch, listen to How to make $1000 from your couch and Six Ways to Make Money Sitting On The Couch.